The I.Ae. 27 Pulqui I was an Argentine jet fighter designed at the "Instituto Aerotecnico" (AeroTechnical Institute) in 1946. Only one prototype was completed; unsatisfactory performance led to the aircraft being superseded by a later design. It was the first in a series of 10 reaction models, many of which were nothing more than plans. Among them the D-720 from the Engineer Dewoitine. The design was created by a team led by the French engineer Émile Dewoitine which included engineers Juan Ignacio San Martín (mil. ), Enrique Cardeilhac and Norberto L. Morchio. The fuselage was semi-monocoque with elliptical cross-section housing a single Rolls-Royce Derwent 5 engine with the air intake in the nose and the ducting surrounding the cockpit. The reduced internal fuselage volume forced the fuel tanks to be installed in the wings, which resulted in a significant reduction of its range. The prototype flew on 9 August 1947 with test pilot 1st. Lt. Osvaldo Weiss at the controls. The history of this aircraft was brief, as its performance was considered unsatisfactory and in the meantime the studies for the more evolved FMA IAe 33 Pulqui II were quite advanced. Nevertheless, its role in the history of aviation is quite significant as it was the first jet combat aircraft developed and built in Argentina and Latin America. This made Argentina the 5th nation in the world to accomplish this task by itself. Brigadier Mayor Juan Ignacio de San Martin, former president of I.A.M.E. (Industrias Aeronauticas y Mecanicas del Estado). Photo courtesy of Juan Ignacio de San Martin, grandson of the Brigadier. San Martin enrolled in as a cadet in the Colegio Militar de la Nacion en 1921. After studying aerotechincal instruction he started working in the Fabrica Militar de Aviones de Cordoba. In October of 1931 he traveled to Italy to study at the Real Instituto Politecnico de Turin where one of his instructors was Modesto Panetti. By December of the same year he was a First Lieutenant. He received degrees in industrial engineering from Italy and millitary engineering from the Argentine military. In 1935 he became a doctor of aeronautical engineering. In January of 1936 he was named as interim head of the Direccion de Aerotecnica and in July of that year he was sent tot he Direccion General del Material Aeronautico del Ejercito. In 1944 he became the director of the Instituto Aerotecnico. In 1945 de became president of the comission of Acquisitions. In 1947 he was named Brigadier. debt that England owed to Argentina that the airplanes were acquired. 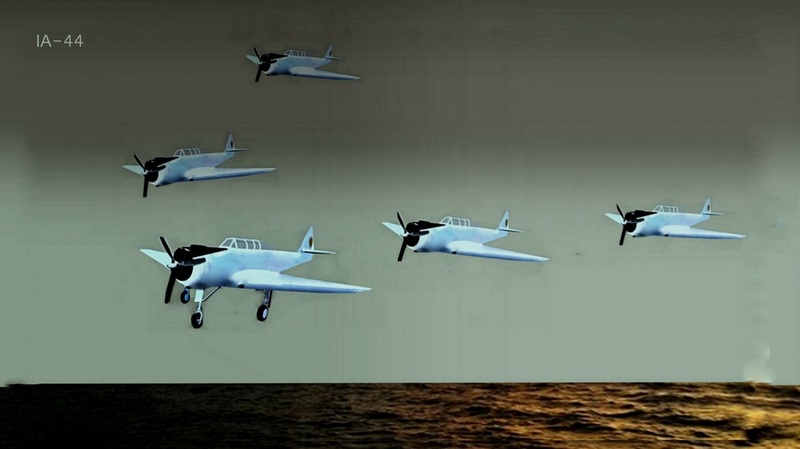 England could not pay the debt outright so arrangements were made for the airplanes. Some of the planes were used during the civil conflict known as the "Bombardeo de la Plaza de Mayo", Plaza de Mayo Bombing. The Air Force Glosters went against the Navy AT-6 Texans and managed to bring one down in what was to be the first toppling by a reactor in the Americas. 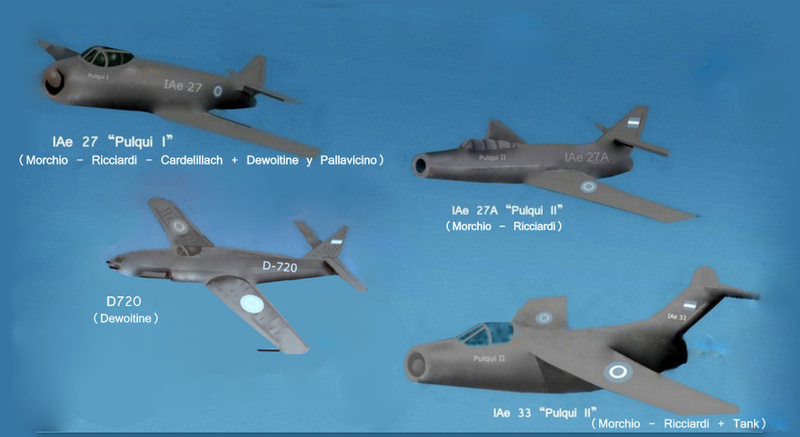 Motivated by the Argentine Air Force, the country not only acquired important aerial material but also scientists such as Emile Dewoitine (lead designer of the Pulqui I which debuted in 1946 with a Rolls-Royce Derwent 5 engine), Cesare Pallavecino (of the Caproni Group), Kurt Tank (father of the folke wulf) and Reimar Horten (glider projects). At the same time, in order to develop their pilots, they acquired the services of none other than Adolf Galland who had taught English pilots after being freed as a WWII POW. 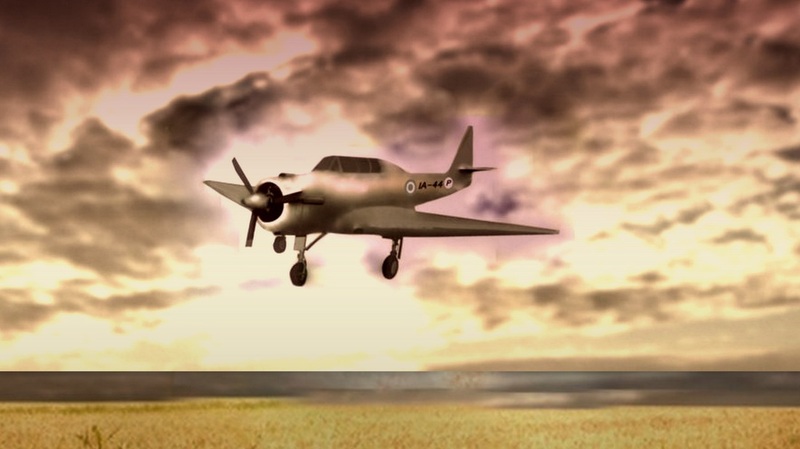 The results of the investment were quick and Argentina became the sixth country in the world (after the US, USSR, England, France and Sweden) to manufacture jet aircraft technology, the first in South America. With the Pulqui II project, Argentina was elevated to the US and USSR's level. The Pulqui II was an airplane comparable with the Russian Mig-15 (another of Tank's possible projects) which had halted with impunity the bombings by the B-29 Superfortresses during the Korean War. The Pulqui project eventually evaporated for political and economic questions. After Peron was ousted many of the scientists forcefully left or were absorbed into large companies (along with their projects) such as Lockheed, Boeing, Republic and Martin. Kurt Tank was accused of having a fake passport and, as it turms out, he did. The Argentine secret service had gotten him into the country in order to "steal" him from the Soviets who were interested in his services. He eventually went to India where he designed the Hindustan Aeronautics HF-24 Marut ("Spirit of the Tempest"). Many believe that this was to be part of the Pulqui's evolution. Above is the cabin of a Mig-15 which, as I mentioned before, may have been a design of Kurt Tank. Tank arrived in Argentina in 1947, not speaking Spanish but with the plans for the German project TA-83 from the factory Focke Wulf. The first plane that Tank made in Argentina was a copy of the TA-83 which was his starting point. By 1950 the first prototype of the Pulqui II was ready for testing. It was piloted for the first time by Captain Edmundo Weiss on June 27, 1950. It possessed a retractable tricycle landing gear, pressurized cabin, retractable roof that could detach, antiballistic windshield, ejectable seat and auto pilot. It had its official debut on February 8, 1951. Tank called Peron in Buenos Aires from Cordoba and advised him that the airplane would arrive to the airport before the President himself. Sure enough, he was correct. During the presentation ceremony Peron expressed his admiration and gratitude for Tank. The Pulqui II's first tragedy occurred in May of that year after 28 test flights when a defect caused the death of Captain Vedania Mannuwal, a fighter pilot. This led to the third prototype and many more test flights. 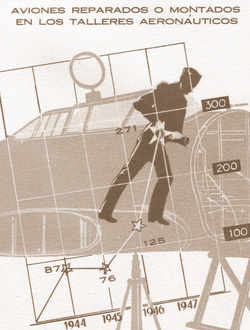 Two days before the newest version was to be presented to Peron in October of 1952, another crash cost the life of Otto Behrens who was an important part of the entire process. His death was mourned by the entire country, especially the Germans now working in Argentina. By 1953 the fourth prototype was ready for testing. In 1954 a world tour was planned to exhibit the airplane to possible buyers. FMA also received visitors from the USSR, US (from the company that manufactured the P-8 Sabre) and Egypt who were interested in the airplane. Unfortunately, just when the project was ready to bear fruit, a coup turned the country upside down. Many of the scientitst and enginners associated with the project were forced from the country, including Kurt Tank. The new government showed little interest in keeping the project alive, although those who remained struggled to make it work. In a desperate attempt to change momentum, FMA planned a high profile test flight from Cordoba to Moron back to Cordoba including three quick rounds over the Buenos Aires airport, without supplementary fuel tanks. The pilot, Captain Rogelio Balado, was able to make the entire trip, but a fault in the system caused a lack of oxygen for him and he crashed on landing in Cordoba. Brigadier Ahrens from the Argentina Air Force approached FMA requesting an estimate on the fabrication of 100 Pulquis. He was advised that 10 could be available immediately and that number 100 would be finished within 5 years. Ahrens decided to give the contract to the Americans for 100 F-86 Sabres because they would be available immediately. This basically ruined FMA's future possibilities to export the Pulqui II. 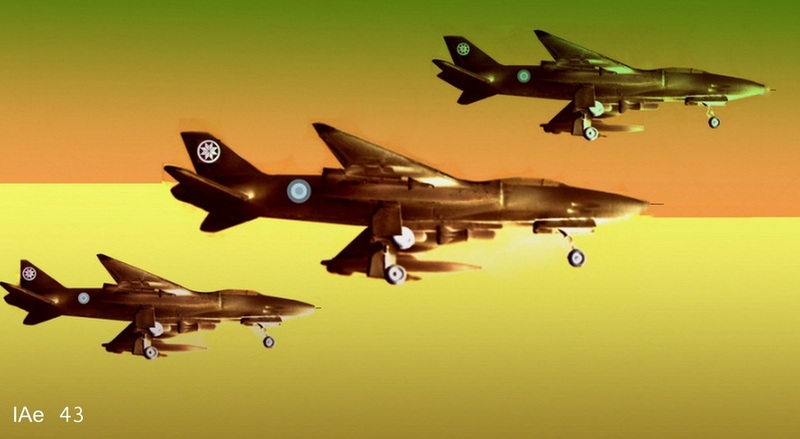 Ironically, the Air Force only received 28 Sabres, all veterans of the Korean War, 5 years after the fact. 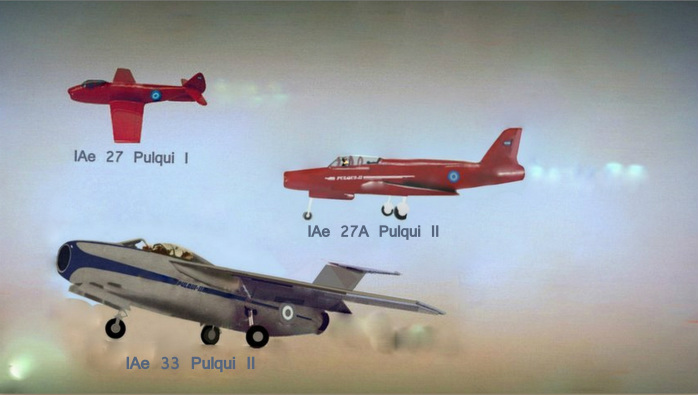 Computerized image of the IAe 43 "Pulqui" which was never made in Argentina. HF-24 Marut preserved at the Oberschleissheim museum near Munich. We found this photo on Wikipedia. IA37-designed by Horten and erroneously known as the "Pulqui III". It was supersonic with 2 turbines. IA38-also designed by Horten which consisted of four-engine propelled Argentine-manufactured motors I.AE.16, "El Gaucho". IA36-"Condor II" or "Pentaturbo" was a transport plane with 5 turbines for 30 passengers designed by Kurt Tank. The design was eventually adopted by the French Sud-Ouest and later Boeing. IA43-"Pulqui III" supersonic hunter-interceptor, also designed by Tank and believed to be the model eventually developed by India. 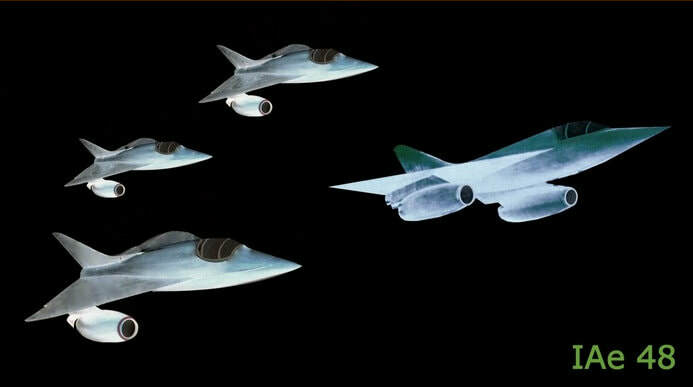 FMA, which had been a world leader in flight technology, became a factory that built licensed products. Its last autodesigned product was the IA58 Pucara. The construction was completely metallic, and the cabin was pressurized with a bubble type cover. Photo: IAe 33 Pilot with a type H-1 Flying Helmet (Late 1940s, early 50s, Experimental Argentine Version? ), and WWII A-14 Oxigen mask. Above is a Pulqui II, a figher made by Argentina. The pilot used a jet-style helmet painted white. The photo is from a government publication of the era. In the photo Captain Edmundo Weiss is with the Pulqui II. It was before the inaugural flight of the Pulqui II in 1950. Weiss was the leader of the Test Pilot Squadron. Weiss appears to have a WWII era parachute and a RAF Type C leather flight helmet with Mk.8 style flying goggles and E or G type oxygen mask. The first Argentine to fly reaction planes. He broke 2 world records in speed. One of the first 10 pilots in the world to fly above the sound barrier. The only Argentine aviator who tested 2 reaction planes, built in the country. In the photo he is seen before the inaugural flight of the Pulqui II in 1950. 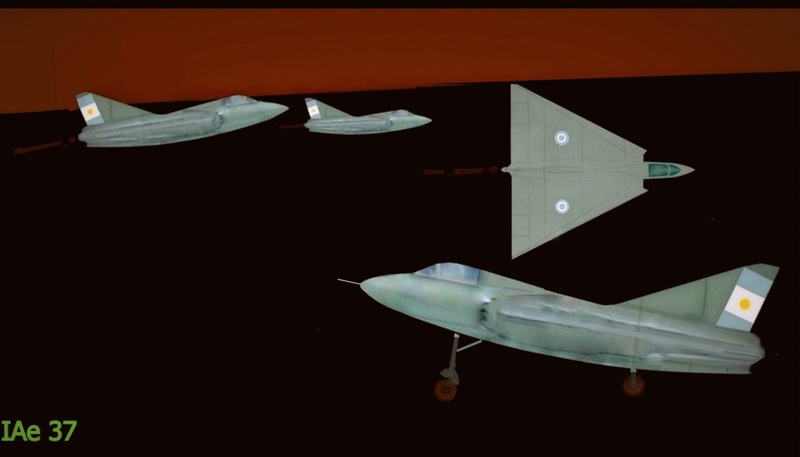 Computerized image of the P-49 (IAe 33): In 1949, in order to compete with the "Pulqui II" project, Horton presented a prototype of a Delta flying wing propelled by a reaction motor RR Derwent IV. But it was dismissed after finding the prototype designed by Kurt Tank in advance. 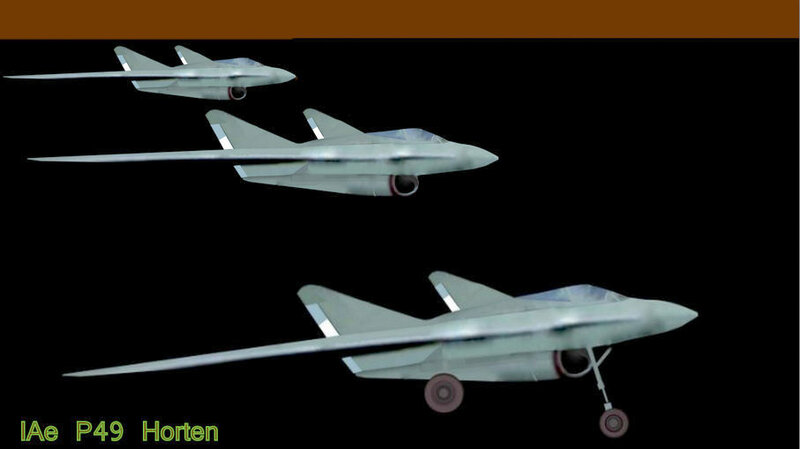 This model is possibly based on the Volksjager Horten HO X project. WWII. R.A.F Flight Uniform. National Air Space Museum. The FMA I.Ae. 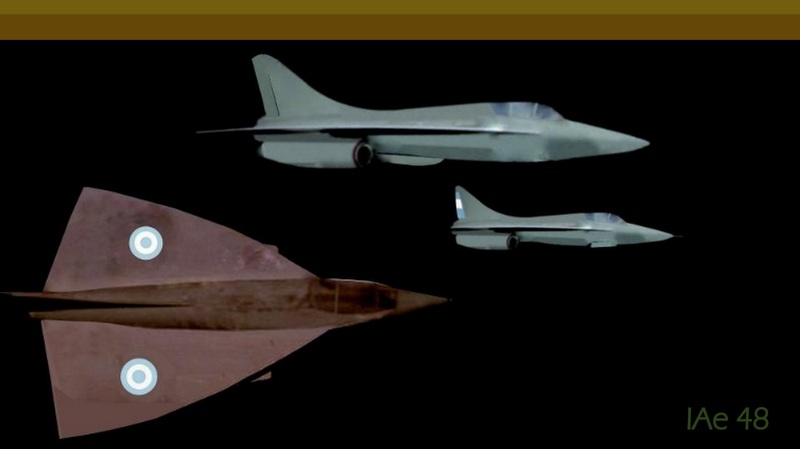 37 was a prototype jet fighter developed in Argentina during the 1950s. It never flew and was cancelled in 1960. Computerized image of the IAe 48. Project by Kurt Tank. Model derived from the IAe 37 from Reimar Horten. He never made it. On the left is an Avro-Gosport 504 biplane. The first unit was tested on October 2, 1929, the same month that the Lorraine-Dietrich 450 hp motor was made. That motor was used in the Dewoitine D-21 which was the first combat plane built in Latin America. Above right is a Bristol. Lower left Ae.C-4. Lower right Ae.T-1. 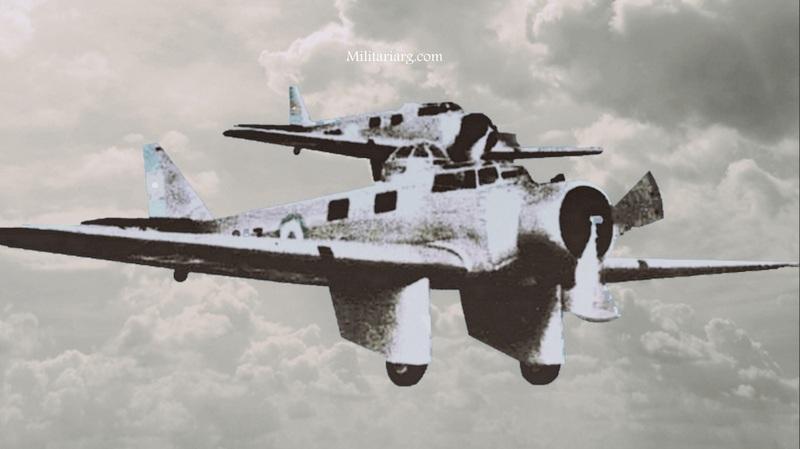 The FMA AeMB.2 Bombi was a bomber aircraft developed in Argentina in the mid 1930s. It was a low-wing cantilever monoplane of conventional configuration. It was fitted with fixed tailwheel undercarriage, the main units of which were covered by long, "trouser"-style fairings. The initial AeMB.1 configuration was fitted with a dorsal machine gun turret, later removed from the AeMB.2 to improve stability. 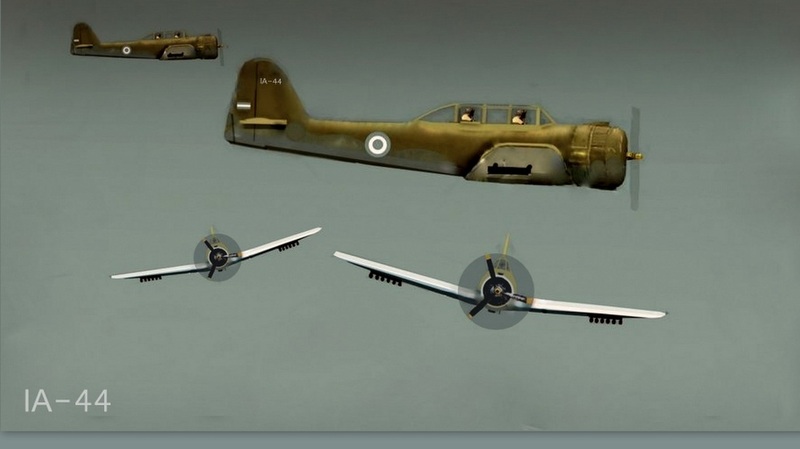 Fifteen production examples saw service with the Argentine Air Force between 1936 and 1945. Only two were lost to air accidents. 400 kg (880 lb) of bombs. Left: Ae.C1/2. Right: Ae.T1. 1933 Caras y Caretas. 1928 Avro 504K "Gosport" (Biplane basic trainer, license-built. 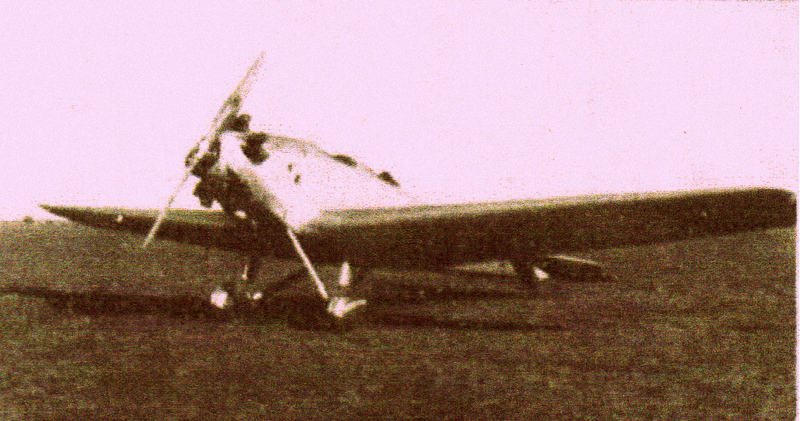 First aircraft produced by FMA. 1930 Dewoitine D.21. (Biplane fighter, license-built). 1931 Ae.C.1 (Civil tourism aircraft prototype). Initial version Basic trainer. Later version first national design. 1932 Ae.C2/ Ae.M.E.1 (Civil tourism aircraft C2. Basic military trainer M.E.1. 1934 Ae.M.Oe.1 / Ae.M.Oe.2. (Variant of the Ae.M.O.1, observation and training). 1935 Ae.M.B.1 / Ae.M.B.2 "Bombi" (First bomber aircraft built by FMA). FMA, autogenous welding. Caras y Caretas 1935. Lateral view of an Ae.M.Oe.2 after an accident. . Frontal view from an Ae.M.Oe.2 (Obsevation and training version of the Ae.M.Oe.1). In 1938 2 distinct types of apparatuses were made under license. The first took first took flight in 1939 and was called the Focke Wulf 44-J "Stieglitz" (Jilguero). It was a biplane for training and acrobatics. It ran on a Siemens Bramo radial motor and was cooled by air. It was produced in several series and used for military purposes as well as civilian basic training. Between 1936 and 1942 the factory made 32 planes, 26 propellers and 10 Wright motors. In 1937 it finished 25 airplanes under German license, among them the Focke Wulf 44-J and the first national metal propeller. In 1943 the Instituto Aerotecnico was created. Curtiss "Hawk 75-O" Airplanes made in Argentina by FMA in 1940. It used an 875 hp motor, (Wright Cyclone G-5). Argentina bought a number of the simplified, fixed landing gear Hawk 75Os, (intended for rough-field operations and ease of maintenance) and purchased a manufacturing license for the type. These aircraft used the same engine, Wright Cyclone R-1820-G5 as the Martin 139WAA's (B-10) and Northrop 8A-2s used by the Argentine Army Aviation at the time. Usually armed with 1 x 11.35 mm Madsen machine gun and 3 x 7.65 mm Madsen light machine guns, there was provision for up to 10 bombs of 30 pounds each on underwing pylons. The last Argentinian Hawks remained in service until November 1954. (Wikipedia). 1940 Curtiss "Hawk" 750 (License-built version of the US monoplane fighter Curtiss Hawk 75). 1940 Focke-Wulf Fw-44J "Stieglitz" (License-built version of the German biplane trainer Focke-Wulf Fw44). 1940 F.M.A 20 "El Boyero" I.Ae.20 (Tourism aircraft, series built by Industrias Petrolini). 1943 F.M.A 21 (Advanced trainer aircraft prototype based on the North American NA-16-1P fuselage). 1943 I.Ae.22 DL (Advanced trainer aircraft). 1945 I.Ae.23 (Basic trainer prototyper, based on the Focke-Wulf Fw44J). 1945 I.Ae.25 Manque (Assault/transport glider). 1946 I.Ae.24 Calquin (Attack/light bomber). 1947 I.Ae.27 Pulqui I (Jet fighter prototype, first of its kind built in Latin America). 1947 I.Ae.37 Colibri (Two-seat trainer aicraft). 1947 I.Ae.30 Nancu (Fighter/Attack prototype). 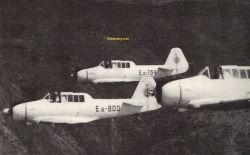 1949 I.Ae.32 Chingolo (Tourism/trainer aicraft). 1949 I.Ae.34 Clen Antu (Glider. flying wing. 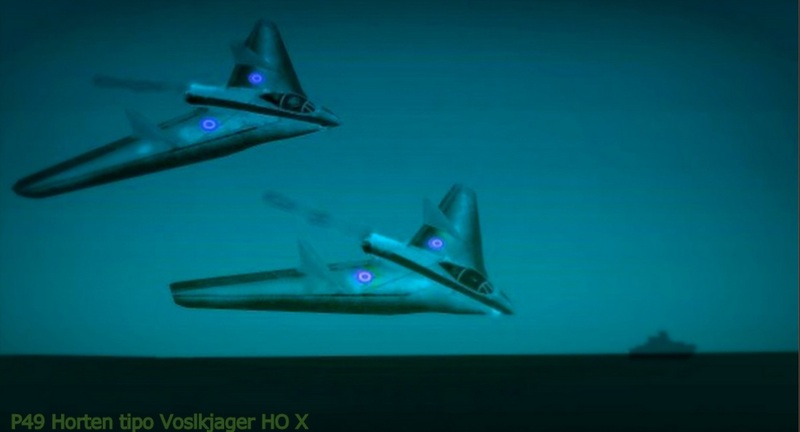 Designed by Reimar Horten, also known as the Horten XVa and XVb). I.Ae.22 DL (DL Diente de Leon, "Lion's Tooth". 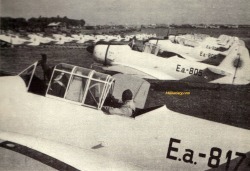 Photo from La Aeronautica Nacional Al Servicio del Pais 1948. The FMA I.Ae.24 Calquin was a 2 seat light attack bomber. It had two 1,050 hp Pratt & Whitney R-1830-SC-G Twin Wasp radial piston engines. The max speed was was 273 mph (440 km/h) at optimum altitude with an initial climb rate of 2,460 ft/minute. It was armed with four 20mm cannons and up to 1,764 lb (800kg) of bombs. Its design was influenced by the de Havilland Mosquito. The prototype first flew in June 1946 and was later ordered into production. The first production plane flew in July 1947 and eventually 200 aircraft were made as the Argentine air force's standard light bomber. Pratt & Whitney R-1830-86 Twin Wasp Radial Engine. Smithsonian Air Space Museum. Left:The FMA I.Ae.24 Calquin. Right: De Havilland "Mosquito". I.Ae.30 Nancu, fighter/attack prototype, project by Cesare Pallavecino. This plane was made entirely in Argentina by the Instituto Aerotecnico de Cordoba. It flew more than 600 km/hour. There was a turbo jet/reaction project with this same model but with different wings known as the Pallavecino I and II which was cancelled. The DINFIA IA 35 "Justicialista del Aire", renamed "Huanquero" in 1955, was a 1950s Argentine twin-engined general-purpose monoplane aircraft built by the DINFIA. The prototype first flew on 21 September 1953 and was followed by a planned production batch of 100 aircraft. The first production aircraft flew on 29 March 1957 but less than half of the aircraft were built when production ceased in the mid-1960s. IA 35 Type 1A Advanced instrument or navigation trainer powered by two IA 19R El Indio radial engines. IA 19SR1 El Indio radial engines. IA 35 Type II Light transport version with a crew of three and seven passengers, powered by two IA 19R El Indio radial engines. IA 35 Type III Air ambulance version with a crew of three and four stretchers with attendants, powered by two IA 19R El Indio radial engines. IA 35 Type IV Photographic reconnaissance version crew of three and camera operator, powered by two IA 19R El Indio radial engines. Constancia II Projected version with Turbomeca Bastan turboprops. Pandora Civil transport version with room for 10 passengers and powered by two 750hp (559kW) IA 19SR1 El Indio radial engines. 1953 I.Ae.44 DL II (Advanced trainer, project (Unbuilt). 1953 I.Ae.35 Huanquero (Transport aircraft; variants "Constancia" and "Pandora" executive aircraft). 1953 I.Ae.41 Urubu (Flying-wing glider, designed by Reimar Horten, also known as Horten XVc). 1953 I.Ae.43 Pulqui III (Project, swept-wing supersonic jet fighter). 1953 I.Ae.35 Condor (Project unbuilt, civil transport). 1953 I.Ae.44 DL II (Advanced trainer, project unbuilt). 1954 I.Ae.37 (Supersonic delta-wing interceptor designed by Reimar Horten. Glider unpowered version). 1957 I.Ae.45 Querandi (Executive transport). Morane Saulnier M.S. 760 Paris FAA.. The Argentine Air Force had 48, of which 36 were license-produced at Cordoba by FMA. Used between 1959–2007. This was the first serial reaction engine airplane built in Latin America. 1960 I.Ae.38 Naranjero (Flying-wing transport/cargo designed by Reimar Horten). 1960 Morane-Saulnier MS-760 Paris (Trainer license built). 1963 FMA IA Guarani II (Transport aircraft, derived from the I.Ae.35 Guarani I). I.A 38 "Naranjero". The DINFIA IA 38 was a 1960s Argentine four-engine experimental flying-wing transport, designed under the direction of Reimar Horten and based on the German Horten Ho VIII project and built by the DINFIA. The IA 38 was an experimental tailless cargo transport based on research by Reimar Horten. It was an all-metal shoulder-wing swept monoplane with the fuselage incorporated into the wing structure. It had no tail, vertical control surfaces were located near the tips of the wings. It had a retractable tricycle landing gear and was powered by four IA 16 El Gaucho radial engines mounted within the wings driving pusher propellers mounted clear of the wing trailing edge. It had a cockpit for a crew of two located on the leading edge of the wing and had a cargo compartment within and below the wing capable of carrying 6100kg (13,448lb) of freight using a rear access door. Although the prototype was completed in 1959 problems with engine cooling delayed the first flight to 9 December 1960. Horten was forced to use the IA 16 engines which were below the power rating of the intended powerplants. As a result, the craft was severely underpowered and showed a poor performance. After the project was cancelled, the IA 38 found its way into the grounds of the Aeronautical School, where it was used as a static display until a fire destroyed the aircraft's skin (suspected to have been an act of arson). The remains of the plane were scrapped afterwards. (Wikipedia). 1995 FMA was closed and privatized in 1995 to Loockheed Martin Corporation.